Martin Gangl draws his musical influences from many styles and traditions. Throughout his musical journey, Martin has gone on to explore the worlds of classical and fingerstyle guitar, country blues, jazz and bluegrass. His immersion in these musical forms has brought to fruition an eclectic style of guitar composition and performance. 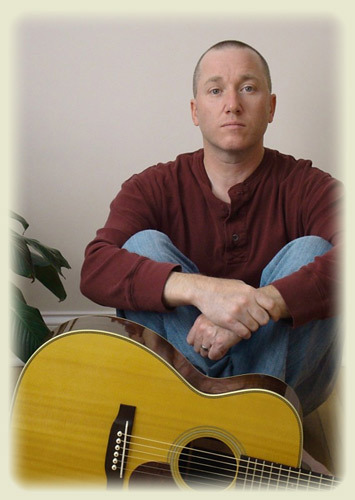 After graduating with a Bachelor of Music degree from Temple University in the 1990s, Martin devoted several years to composing and arranging the music that would eventually be included in his 2006 debut album, Conjuring the Muse, a collection of original pieces and arrangements inspired by the fingerstyle genre of the late twentieth century. Martin is constantly re-tracing his lifelong journey by exploring traditional music from country blues and ragtime guitar to the beautiful melodies of Ireland. This journey has led to his development as a well-rounded guitarist with national and international recognition. As a performer, Martin has delighted audiences with his warm stage presence and intricate solo guitar pieces, many of which feature the use of open tunings such as DADGAD. His music has been featured on the nationally distributed radio programs Echoes with John Diliberto and The Thistle and Shamrock. He has also been featured as an opening act by several acoustic music luminaries including one of his guitar heroes, the late Michael Hedges. Martin currently resides in the Lancaster, Pennsylvania area and teaches throughout South Central Pennsylvania. He is planning to record the follow up to his CD, Conjuring the Muse. The album will feature new original compositions and arrangements.